Meet Alaska's Robin Hopper, the artist. performing at coffeehouses and music festivals throughout the "Last Frontier" and the Lower 48. Robin grew up in Potsdam, New York; a small college town north of the Adirondacks. She attended Potsdam State University as a vocal major, where she earned both a Bachelors and a Masters degree in music education. She taught Elementary Music in the Madrid-Waddington School District for 6 years before moving to Alaska in 1984. She has been a Classroom Music Specialist in the Anchorage School since 1984, and is an adjunct faculty member of the University of Alaska, in the Music Education department. In 1991, she was awarded the title of "Nationally Certified Music Educator" by the MENC (Music Educator's National Conference) - a status then bestowed on only 244 teachers nationwide, and in 2000, she was named "Anchorage Educator of the Year" by the Anchorage Educators Association. She feels fortunate to be one of the lucky few performing songwriters whose "day job" also revolves around music. As a child, Robin's home was filled with music from the likes of Tennessee Ernie Ford, Chet Atkins, The Rooftop Singers, Mills Brothers, Peter Paul and Mary, Simon & Garfunkel, and the Kingston Trio. Her music is flavored with the taste of their harmonies and "easy listening" style. As an adult, Robin has attended many songwriting camps and events, and has been influenced by many of today¹s best writers and performers. Her music reflects the influence of such writers and mentors as Steve Seskin, Cliff Eberhardt, Kristina Olsen, Dave Carter and Tracy Grammer, Johnsmith, and Bill Staines, to name a few. has the same flavor and feel, and contains eleven new, original tracks. Her third CD is entitled "Pass It On", and has nine originals, plus four covers. Robin's favorite pieces from the first three CDs. You won¹t find any Alaskana here, just Robin at her singer-songwriter best. There are also four new pieces sprinkled throughout, to keep things moving forward. "The Alaska Collection" is just what the name implies - all of Robin's recordings about Alaska, gathered together for the first time on one CD. In the spring of '95, she was commissioned to compose, record and perform "Arctic Fanfare"; the musical theme for the 1996 Arctic Winter Games. This piece received extensive airplay and news coverage in connection with the games. 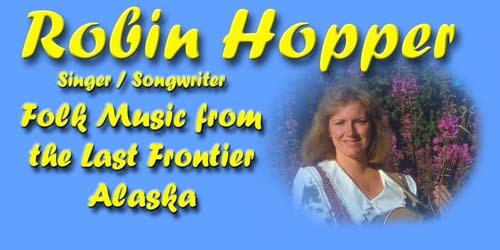 As past Vice-President of the Anchorage Folk Festival, and coordinator of "Folk Week In The Schools (a Folk Festival sponsored event)", Robin has been very active in supporting other musicians, as well. She sponsors house concerts and songwriting seminars in her living room regularly, and hosts an annual songwriter's showcase every January. and forgotten favorites from the 30's and 40's.